A hard fought 2-1 win was the result for the U19A side in their UEFA Youth League clash with Internazionale on Wednesday which leaves them with three point lead over second placed PSV in Group B. The contest was the proverbial game of two halves with the blaugranes dominating in the opening 45 minutes thanks to goals from Konrad and Mortimer. However, the Italians fought back in the second half, pulling one back although Barça also had chances to put the result beyond doubt. 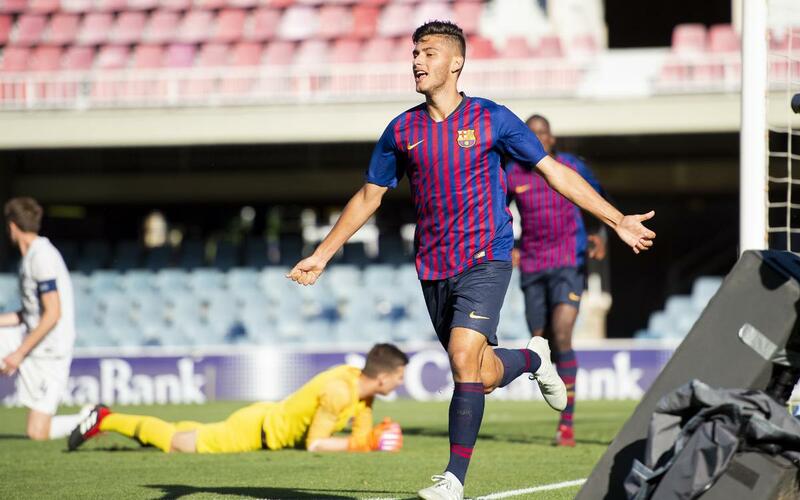 The U19A began strongly and their superiority was rewarded when Konrad handed Barça the lead after good work by debutant IIliax. The home side threatened a second and Konrad turned provider to create a good chance for Nils Mortimer. Inter came close to equalising when Colidio’s effort brushed the post. Nevertheless, Barça went into the break with the upper hand following Nils Mortimer’s effort which doubled their lead, the blaugrana steering in a rebound after a good save by Italian keeper Dekic. After the break the visitors got themselves back into the game. The Italians forced a penalty with just two minutes of the half, Colidio converting it to make the score 2-1. The striker came close to levelling things up the nerazzuri, keeper Arnau Tenas making an excellent save to deny the Inter player. In the final minutes there were chances for both sides but the was no more movement in the scoreline with Deni Silva’s team taking the win to reinforce top spot in Group B.